As vehicular traffic is increasing with each passing day, it becomes extremely cumbersome to commute from one place to another. Even if you are one of those who would travel by metro, you need a vehicle to reach there which again is a task in itself manoeuvring through the city streets. Also, with global pollution level on the rise, there is a dire need to use eco-friendly, non-polluting vehicles. What better if your backpack acts as a connect between your home and the metro station? Yes, you read it right! Movpak is a backpack that would carry everything you need for the day and at the same time act as a vehicle to move from one place to another. At first glance, it looks like a normal backpack which you unzip, put stuff inside and carry it on your back. But upon closer look, one can notice a board at the back of the bag which can be slid down and used as a skateboard. The wheels of the skateboard are connected to 2 motors powered by a chargeable battery that will last up to 10 miles and can reach speeds of up to 20 miles/hour. The onboard battery can be plugged in and is expected to get fully charged within 2 hours. Being on the heavier side at 17 lbs, you wouldn’t want to take this on a trekking expedition but would be really handy if your smartphone runs out of power as the bag contains a USB port that can be connected to your phone. With its built-in mic and speaker, the skateboard can be manoeuvred with your voice using Siri or Google Now, thereby providing you hands-free operation. The speaker can be used to listen to the songs from your playlist. 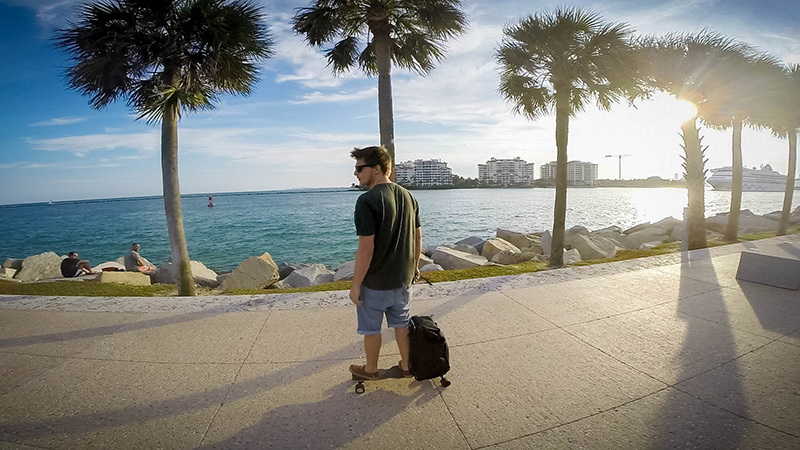 The bag also sports a handle that can be used to roll the bag around with the help of skateboard wheels. The bag has a capacity ranging from 18-35 liters depending on the bag model and is also swappable. It also has front and back lights which will be handy while riding in the dark. The bag also comes with a wireless remote that would help those who are new to riding a skateboard, in controlling it. Ivo Machado, Co-Founder of Movpak says that they earlier had a prototype that was three times heavier than the current model. But they had managed to reduce the weight and launch it on Kickstarter. But owing to high costs, they were unable to offer pre-orders and the campaign eventually failed. “Failing a campaign after 3 years of work was pretty hard. But we overcame that, improved the product, reduced the cost and launched it again on Indiegogo and in one week of the campaign we already achieved 200% of our goal. We are very happy and proud that we never gave up”, he concluded. They now plan on having a deal with a major manufacturer that would aid them in reaching out to newer audiences. With orders already placed from 36 different countries, they look to expand beyond the horizon by establishing their business in these countries. They look to target office and college goers who would prefer an alternate, non-polluting transport. Drive Straight To Your Parking Spot With Constapark!